Of course, it is not unlimited. If you read the terms of service, you will find some definitions or rules setting out “reasonable” use. For the typical website the average user or small business is going to set up – these are more than generous. Don’t imagine you are going to host a competitor website to FaceBook / Google / YouTube / ebay (pick your favorite major web player) on your “unlimited” account running WordPress or Joomla! or Drupal (or whatever CMS you like) – it’s just not going to happen. Heavy duty websites need heavy duty infrastructure, hardware, and software – a low cost, generic, off the shelf solution won’t cut it (but if you have to worry about competing with the big boys, I’m pretty sure you’ve got the money to afford the more expensive stuff). At this time, this site is hosted on one of those “unlimited” packages. I always wondered what unlimited storage and bandwidth meant. These techniques should work with any site using cPanel as their web management interface. That’s not bad. Sure, if I have a graphic heavy page, it might take a few seconds to download everything, but still acceptable. Of course, those calculations assume my site is being accessed every single second of every single hour, every single day (I wish, I really, really wish). For the time being, this is a non-issue because I don’t get enough visitors to worry about several trying to access the site simultaneously (as an aside: there are 86400 seconds in a day, according to the birthday paradox, if I have 347 visitors a day to to my site, there is a 50% probability that at least two of them will try to access the site during the same second – if I have 893 visitors, the odds are 99% that at least two of them will try to access the site during the same second). This is a little trickier, but cPanel gives us a possible hint. I noticed that this maximum file size changes depending on how much disk space I am using. The less space I am using, the bigger my maximum file is. 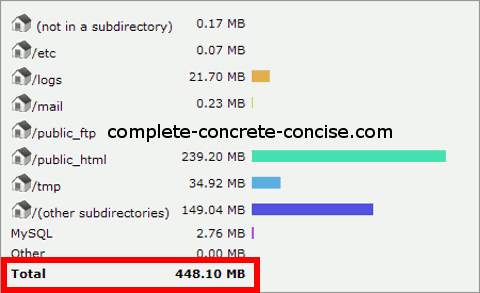 So … I estimate my “unlimited” disk space is somewhere around 41GB (used space + maximum file = 41GB). Again, this is more than any small (or smallish) website should reasonably need. If you need to host lots of images, lots of videos, lots of files, etc, then there are services that you can use for free: Flickr, YouTube, Vimeo, SourceForge and, best of all, they have the bandwidth and infrastructure to support that.